Ralph Talbot off Mare Island, California, 11 April 1942. Ralph Talbot (DD-390) was laid down at the Boston Navy Yard 28 October 1935; launched 31 October 1936, sponsored by Mrs. Mary Talbot, mother of 2d. Lt. Ralph Talbot, and commissioned 14 October 1937, Lt. Comdr. H. R. Thurber in command. 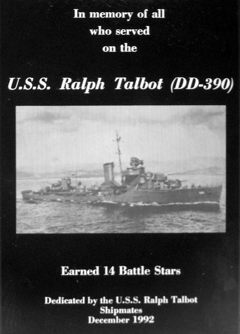 Prior to the U.S. entry into World War II Ralph Talbot was assigned to Destroyers, Battle Force, operating in the eastern Pacific. In early 1941, she began a major overhaul at Mare Island and in April, she rejoined the fleet at San Diego. At midmonth, she steamed to Pearl Harbor whence she operated for the remainder of the year. Moored at Pearl Harbor on the morning of 7 December, she manned her guns and began preparations for getting underway within minutes of the start of the Japanese attack. By 0900 she was en route out of the harbor having already splashed her first enemy aircraft. After the attack, she searched for enemy submarines and, on the 14th, sortied with TF 14 on the first of a series of carrier force screening assignments. In January 1942, she sailed with TF-8 during raids against Japanese positions in the Marshalls and Gilberts and in February and March against Wake and Marcus Islands. Returning to Pearl Harbor with TF 16 on 9 March, Ralph Talbot joined TF 15 on the 19th and through May escorted convoys between Hawaii and the West Coast. In early June, she escorted to the northwest of Hawaii auxiliaries that refueled and replenished the victors of the Battle of Midway, then escorted TF 16 back to Pearl Harbor. On the 14th she got underway for Australia and New Zealand, whence she sailed on 22 July for the Solomons and the first of the island assaults that would eventually lead to victory. Assigned to TG 62.6, she screened the transport group to Guadalcanal arriving on the morning of 7 August, and then patrolled off the transport area through the landings. On the 8th she took up patrol station north of Savo Island and at 0145 on the 9th received word of three enemy ships inside Savo Island. Soon afterward, heavy gunfire was seen to the southeast, the first Battle of Savo Island had begun and Ironbottom Sound was on its way to being named. Half an hour later, a friendly destroyer shelled Ralph Talbot. The error was quickly rectified, but within minutes an enemy cruiser appeared off her port quarter. Both ships opened fire and search light switches were flicked on. Ralph Talbot’s cables had been severed in the earlier shelling, but the enemy’s worked. The spotlighted 390 took a hit in the chart house, which destroyed radar equipment, cut fire control circuits and ignited fires. Three more shells came in close succession, hitting the wardroom, the starboard quarter and the underside of gun No. 4. Among the 12 dead were the doctor and the chief pharmacist’s mate.